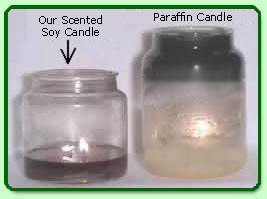 Soy versus Paraffin candles. Do You know what toxins are in your candles? Soot is the solid particle that results from incomplete combustion of carbon containing fuels, primarily petroleum based fuels. This is called petro-carbon soot which is not found in soy wax. Soy wax is completely petro-carbon soot free. Soy candles produce zero petro-soot than traditional candles made from paraffin. Lower soot levels help maintain pure air quality and reduce home maintenance problems associated with soot deposits. Soy wax has given consumers the ability to burn clean burning candles from sustainable sources. Farmers have a rapidly growing new market. Soy wax is the first wax innovation in the candle industry in over a 100 years and is rapidly becoming the candle industry standard for the twenty first century. What would you rather have burning in your house? There are several carcinogen compounds (cancer-causing agents) found in paraffin candles. Virtually all of them have been considered "toxic air agents" by various environmental agencies and the state of California, in particular. Since soot particles are very small, they can potentially penetrate the deepest area of the lung. Researchers caution that the very young, the elderly and those with respiratory diseases like asthma should avoid exposure to candle soot. Again soy wax burns petro-carbon soot free. But there are other factors that contribute to black soot deposits in candles. Keep in mind the only completely soot free candle flame is a natural gas flame. This flame is completely blue in nature and has what is called a complete combustion. Can we get a candle flame to combust completely? Well, almost. Candle Flames, wood burning fire places, all have incomplete combustion which produce soot, but the good news is it is not the toxic black petro carbon soot that you find in petroleum based candles. There are some things you can do to radically limit the amount of soot produced from the candle flame itself. Learn more by reading our article about soot-free candles. Soy wax candles generally burn longer than paraffin candles. Soy wax is derived from natural vegetables while paraffin is a refined gasoline by-product. Soy wax is 100% biodegradable while paraffin was is not. Soy wax spills clean up simply with soap and water while paraffin wax spills are very time consuming and extremely difficult to completely clean up if at all. Soy wax releases fragrance easier than paraffin candles. Soy wax purchases support American farmers!